Shorewood residents voted to approve two referendum questions on the ballot to improve the Shorewood School District’s historic school facilities. The April 2nd election results indicate that 61% of Shorewood residents voted in support of the first referendum question, which will authorize the District to borrow $65M for District-wide facilities projects, while 66% voted in favor of the second question, which will increase the annual revenue limit by $275,000 for ongoing and recurring District-wide facilities maintenance costs. The referendum approval comes after nearly three years of assessment, master planning, and extensive input from the community and staff, a process led by the Shorewood School Board. Community members originally identified “Modernizing and Maintaining Our Historic Schools” as one of the top five priorities at a District Visioning Summit held in February 2016. Since then, the District developed a comprehensive facilities plan to make improvements at all four schools in Shorewood. The facilities work will address critical infrastructure needs at all four schools, including improvements to academic classrooms and support areas in both elementary schools, and the renovation and expansion of the Main Academic Building at the high school. The revenue limit increase will help ensure that these facility improvements are maintained in the future. 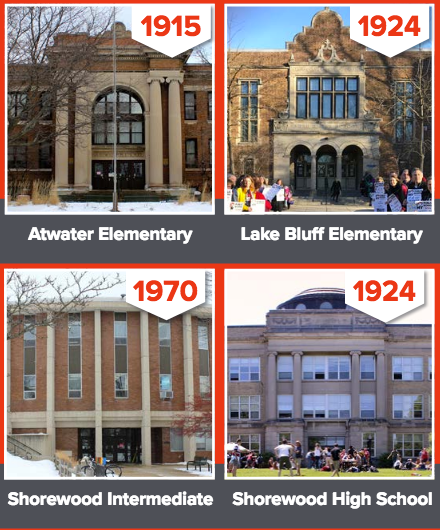 Of the District’s four historic schools, three are over 90 years old. The collective impact of the two questions on the projected mill rate increase over the current rate is approximately $0.31 per $1,000 of fair market property value, or $31 per year for every $100,000 of property value. Design work will begin immediately and the projects will be competitively bid in early 2020. Construction work will begin in Spring 2020 with anticipated completion by Summer 2023. In the coming weeks, the District will work with the construction manager Miron Construction Co., Inc. and architect Eppstein Uhen Architects to begin moving forward on project planning. All projects throughout the construction process will be competitively bid. The District is committed to continuing transparent communication throughout the entire facilities improvement process, and will engage the community and staff as the design phase moves forward. All design and construction updates will be posted on the District website at www.shorewoodschools.org/facilities/.